The local capercaillie population has been declining in recent years, mainly as a result of a loss of habitat. Known for its beautiful coloring and mating display, the capercaillie provides another example of how forest destruction can have a wide-ranging impact. The capercaillie (Tetrao urogallus) is found in the Nordic, boreal area, occupying coniferous and conifer-dominated mixed forests. It is also present further down south, in the subalpine spruce forests, across the Alps or the Pyrenees. In the local Carpathians, it can be found where spruce forests are present. This happens because the capercaillie needs wide areas of old, shady forest, scattered with bogs, areas of peat and undergrowth of ericaceous plants. The bird feeds on bilberry bushes in the summer, while during winter it eats conifer needles and shoots. Size and coloration set the male and female capercaillie apart. The male is bigger than the hen, roughly twice the size. Their body feathers are dark grey to dark brown, and the breast feathers are dark metallic green. The belly and undertail vary from black to white. The males have a length from 54 to 85 cm, with a wingspan of 90 to 125 cm, and an average weight of 4 kg. By comparison, the capercaillie hen reaches between 54 and 64 cm in length, with a wingspan of 70 cm. The feathers on the upper parts are brown with black and silver barring, with a lighter color on the underside. Both the male and the female capercaillie have a white spot on the wing bow and a red spot of naked skin above each eye. Their legs are feathered for protection during the cold season. The old forests, with the abundant ground vegetation, old trees and tree regrowth, provide the optimum habitat for both the adults and their young chick. Here, they are able to find there the food supply they need and the quality environment to nest and move around. The open stands in these forests are also important, allowing the capercaillie to fly downslope. With their body weight, and short, rounded wings, these birds avoid young and dense forests when flying. In cleared areas, the bird cannot defend itself against predators. Similarly, in dense forests, it is difficult for it to take flight as it needs more space. It can hit the tree branches and break its wings. 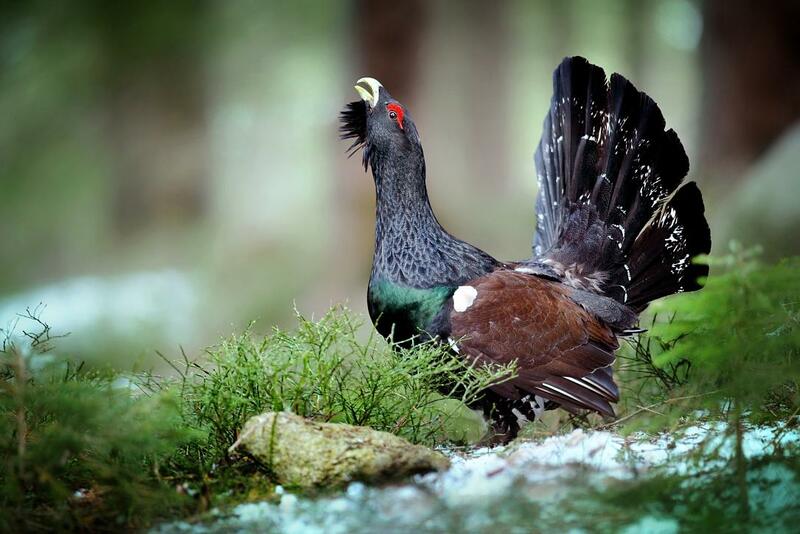 But with the loss of the subalpine spruce forests, the capercaillie is seeing its habitat disappear. And with it, the species goes as well as the bird does not use other types of forests. They are considered an indicator species since they need this particular forest. If the forest is disappearing, so is the capercaillie. The capercaillie’s need for the old spruce forest also serves to emphasize the poor habitats offered by spruce monocultures. These are planted very thick, not allowing the light to reach the ground and plant, insect or bird species to thrive in them. The disappearance of the capercaillie further impacts the ecosystem. The capercaillie is one of the main prays of the golden eagle in winter time. During summer time, the golden eagle feeds a lot on marmots, but as these go into hibernation at winter, the golden eagle turns to the capercaillie. When these are gone, the golden eagle is impacted as well. Towards the end of March or early April, the capercaillie birds congregate to the leks, where the males are displaying to attract the females that are around. If the hunters go to these areas, they can find the males, which are the only ones targeted for hunting, for taxidermy not for eating. The chicks of the capercaillie or the eggs might also be threatened by foxes. These predate them as the capercaillie is nesting on the ground. The nest is a shallow depression on the ground, lined with vegetation, and often placed at the foot of a tree. Still, the fox is not considered to have a significant impact on the healthy population of capercaillie and the loss of habitat remains the main threat. Across Europe, in recent years, the capercaillie population has seen a downward trend as a result of the fact that the bird is very dependent on the way the forests are managed. A project of Foundation Conservation Carpathia is to look soon at the population of capercaillie in the Făgăraș Mountains, after a similar one will investigate the golden eagle, beginning this year.